April showers bring May flowers so the true colors are not quite shown in the photos below due to the snowy/rainy and cloudy days we’re experiencing this week. Finished the body and began one sleeve. I need to find my bamboo double-pointed needles as these metal ones are very slippery and the stitches fall off the ends. 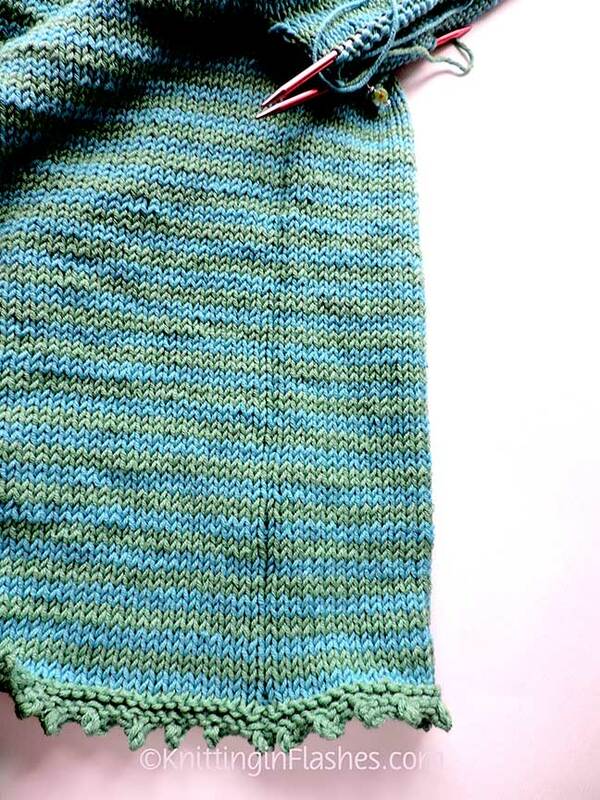 Of course, I could use more than four needles with fewer stitches on the needles. 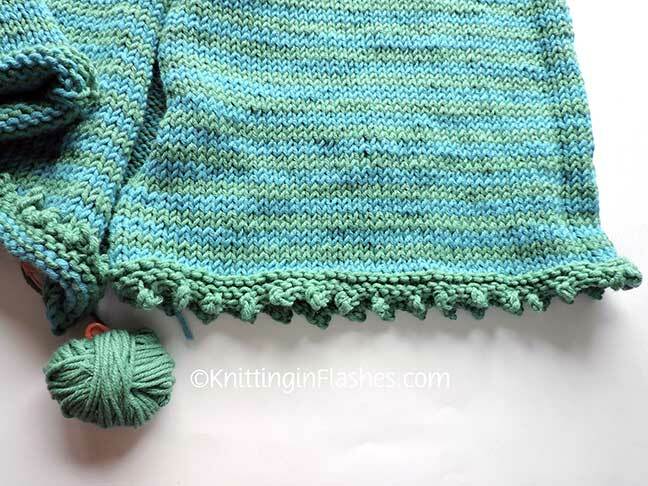 Picot hem – though I did not cut the green yarn yet. Just in case I don’t like it, I can rip it out and try something else without worrying about having too much or too little yarn to work with. I really hope blocking will keep the bottom edge from curling. If not, I’ll need to come up with another plan. Cable cast-on two stitches and bind off five. 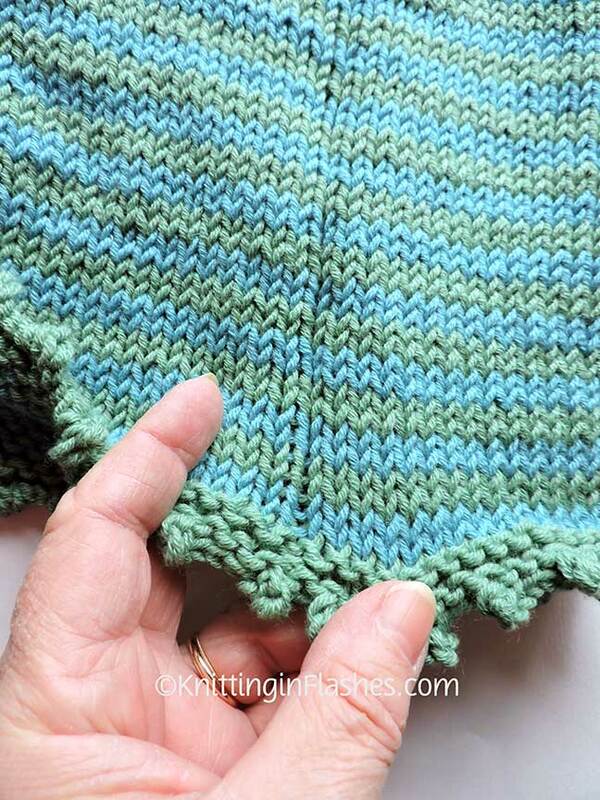 Place the last bind off stitch back on the left needle, cable cast-on two stitches and repeat to the end of the row. Not hard but it uses more yarn. If you have been following me for some time, you know I don’t like to sew seams. However, seams do add structure. So I made fake seams by doing a reverse stockinette stitch at the center underarm point all the way down to the hem. 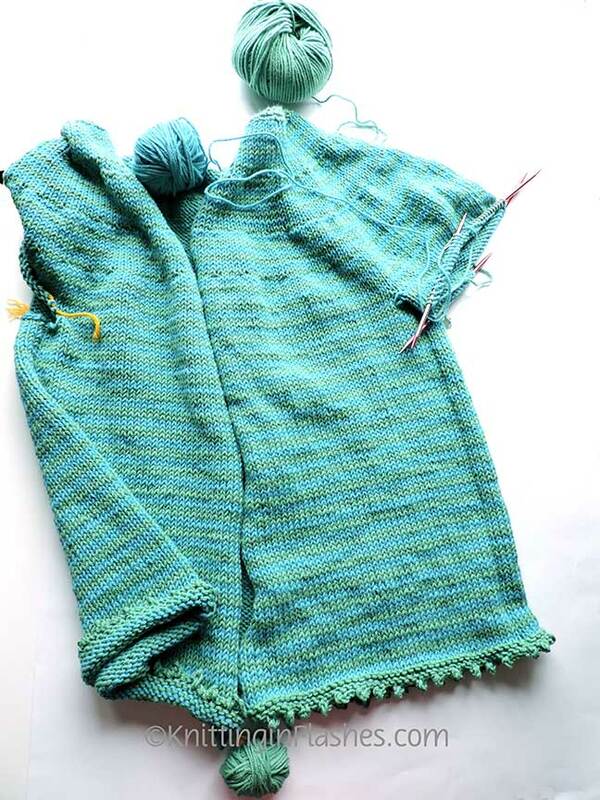 It looks like a seam and will (hopefully) keep the sweater from twisting out of shape. Have you ever used that technique? More importantly – does it work? This entry was posted in february baby sweater, knit, knitting, knitting pattern, sweater, yarn and tagged February Baby Sweater, knit, knitting, sweater, yarn by Patti_is_knittinginflashes. Bookmark the permalink. 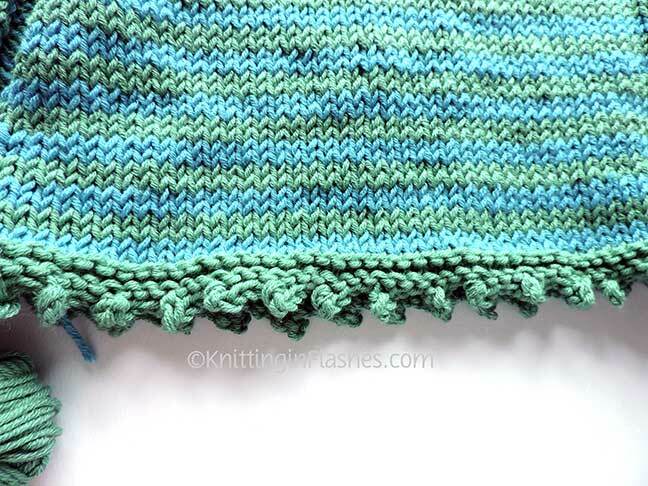 I hope the blocking does help the picot edge – I have not tried it like that, but it looks pretty! I’ve not used the technique, but my thoughts on it are: It will definitely add a break that will allow the fronts and back to be visually separated, but I do not believe it will alter the lay of the fabric. But since the piece was done back and forth, and not in the round, there shouldn’t be as much twisting to the body. I am not a knit fabric expert, this is just my humble opinion. Love the colors!! You have more patience than I do. Looks beautiful.